”Christmas time is here. Happiness and cheer. 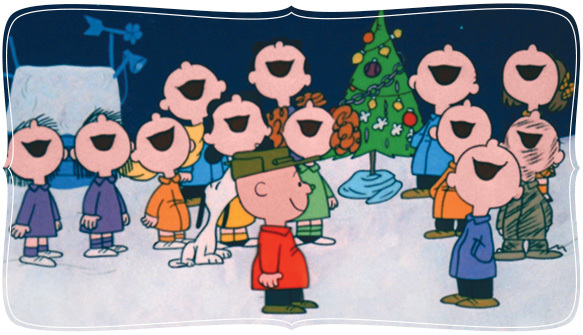 Fun for all that children call their favorite time of year.” Those opening words to A Charlie Brown Christmas immediately bring snowfall and pitiful Christmas trees to mind. It also always makes me think of “Hark the Herald Angels Sing,” which is my favorite Christmas carol and the song the show closes with. There’s a quirky irony here, because I grew up in a church tradition that didn’t celebrate Christmas as a Christian holiday because it wasn’t authorized in the Bible. We celebrated the holiday as a time for families to be together and give gifts, but we didn’t sing Christmas carols at church or talk about the birth of Jesus. We did Santa and snow stuff, but no angels or nativity scenes. This Jesus-less Christmas is the direction some of America is moving toward. Christmas is a problematic holiday for a culture that struggles with its relationship to Christianity. Nobody really wants to give up Christmas, but making it about Jesus is uncomfortable for them. We should not make an issue of that. The Christians who holler about people saying “Happy Holidays” or taking Christ out of Christmas do nothing to help Jesus be more appealing to the world. Signing petitions about creches or trying to force them onto public lands is a dead-end. We need to put the creches in the church yards or into our own yards. We need to make Jesus attractive, not force him down people’s throats. Let’s rejoice at whatever attention our secular society wants to give to Jesus at any time of year. WE, the CHURCH, are the representatives of Christ and Christmas, not America in general (thank God), so let’s take back our light and let it shine on this dark winter’s night while we sing the triumphant songs of joy and peace.